The reckless, wild and weird yet hilarious, history of the World Hockey Association. The World Hockey Association, known to many as the WHA, has been gone for 38 years. During its short existence, from 1972-1979, the league dramatically changed the landscape of the game of hockey, both in North America and worldwide. A feature-length documentary celebrating the good, the bad and the ugly of the fabled WHA, The Rebel League will be filled with hilarious anecdotes, behind-the-scenes wheeling and dealing and simply, great hockey. How did a team of naked Birmingham Bulls end up in an arena concourse spoiling for a brawl? What did opponents think the first time they heard the cry of "Dad!" when Mark Howe wanted his legendary father and teammate, Gordie, to pass? Why did the Edmonton Oilers have to smuggle fugitive forward Frankie “Seldom” Beaton out of their dressing room in an equipment bag? And, how did he earn that nickname, anyway? The WHA began as many ventures do; a moneymaking scheme by two California lawyers. 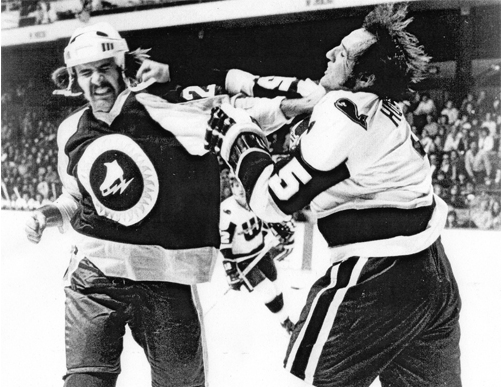 Bill Hunter and Dennis Murphy didn't know much about hockey, but they sure knew how to shake things up. Luring Bobby Hull away from the NHL's Chicago Blackhawks for one million dollars, an astonishing sum for hockey at that time, was a clear pronouncement that the WHA was for real. Throughout the 1970s, the upstart WHA introduced to the world 27 new hockey teams, including multiple future NHL franchises. Along with it came the crackpots, goons, and crazies that are so well remembered as a big part of the league’s bizarre legacy. In the middle of all the chaos came a trail of bounced checks, lawsuits, and folded franchises. The venture was certainly hit-and-miss, but the WHA was much more than a traveling circus of weird and wonderful: it was the vanguard that drove hockey into the modern age. The rebel league put an end to the NHL’s monopoly, freed players from the reserve clause, ushered in the 18-year-old draft and first moved the game into the Sun Belt. A true world league, the WHA introduced North American to future superstars like 17-year-old wunderkind Wayne Gretzky and put European players on the ice in numbers previously unimagined. Though the WHA had a brief stay on the professional sports landscape, its impact was indelible. The rebel league affected the game of hockey on a global level, truly changing the sport forever. The United States' triumph at the 1980 Olympics is the crowning achievement of the country's hockey history, but the foundation for that "miracle" was laid eight years earlier. In February of 1972, the Winter Olympics were proceeding in Sapporo, Japan without much fanfare: the United States was collectively focused on two much more important battles in Asia. With the Vietnam War dominating the headlines and the Cold War still at full-intensity , the American men, almost anonymously, attempted to capture the USA's second-ever gold medal. Suiting up for an Olympic hockey team is a goal for many, but in 1972, at least for Americans, making the team meant more than achieving a dream. Competition was always intense at tryouts, but this year the stakes were even higher: a spot on the United States hockey team offered an alternative to serving during the Vietnam war. Indeed, some of the members of that year's squad were plucked directly from the jungles of Vietnam. The men on the 1972 roster were solely amateurs, as professional NHL players were not eligible to compete. They were not about to let their good fortune go to waste, despite low expectations. The competition from overseas had an unfair advantage, as communist countries fielded professional level-talent: in those economies, there was no way to separate amateur and professional. Somehow, the team that was chosen to finish last in the tournament shocked the hockey world with an 5-1 win over Czechoslovakia, a result some put on par with the USA's iconic win against Russia en route to the 1980 gold medal. When the 1972 Olympics had finished, 20 young men had struck silver. They returned home with those medals, but not the recognition that often accompanied such an accomplishment. There have been several reprints of the book Striking Silver, originally published in 2006 by Tom and Jerry Caraccioli. But, as well-received as the prose has been, the legacy of the 1978 United States hockey team also deserves to be immortalized in another medium; film. The unmistakable impact the World Hockey Association has never been accurately, appropriately nor thoroughly presented. The amazing story of the 1972 USA Hockey team has been buried by history, and deserves to be unearthed. RGTV, through a partnership with TeeVee partners, will change that with two thoroughly enjoyable and uniquely informative features. With both narratives complete in the eyes of history, The Rebel League and Striking Silver are positioned to be an eternally-evergreen pieces that will appeal to sports fans both domestically and globally. A one-time investment of approximately $400,000 will be returned several times over through licensing agreements with over-the-air broadcast networks in the United States, Canada and internationally. After the initial run, a three-to-six-month window, the film will be pulled back for the TeeVee platform. RGTV has earned many Emmy awards for its sports programming, and recent credits include Gonzo @ the Derby, a ESPN 30 for 30 short which aired at the 2016 Tribeca Film festival, and Netfix's One in a Billion, a feature which follows the groundbreaking journey of India's NBA trailblazer Satnam Singh Bhamara. Teevee Makers is a new brand of TV production house born out of an ambition to originate, produce and curate content that directly feeds passions. Passionate about the creation and development of original programming, Teevee Makers' experienced team thrives on buidling brands and pushing boundaries, all with the aim of captivating each audience.